Growing up, we had a tradition of buying my dad a big carton of Whoppers on his birthday. They were his favorite, and he’d keep them on his dresser along with other off-limits items like his wallet and watch. Let me tell you, Whoppers taste better stolen off dressers. I’ve had to change my ways, though. Neither Fuzz nor Todd likes Whoppers so I don’t have anyone to steal them from anymore. In fact, Fuzz kindly gave me permission to use her Halloween Whoppers as I see fit. So, since my dad is coming over and since I haven’t given him a carton of Whoppers in years, I made him a batch of Chocolate Malt Whopper Cookies from the book Baking: From My Home to Yours. These cookies are absolutely fabulous and probably one of the best things I’ve ever made with Whoppers. They were very malty and had the perfect level of sweetness. I read one review where someone said they were tooth-achingly sweet, but I suspect that person might have used a sweetened malted milk drink mix rather than malted milk powder. The malted milk powder I used was Carnation , and it does not have added sugar. It’s similar to Horlicks. The cookies aren’t that impressive to look at, but the texture is excellent. They’re thin and soft, but have chewy/crispy edges thanks to the melted & cooled Whoppers. Let them sit for a while before you taste one. In a medium bowl, sift together the flour, malted milk powder, cocoa, baking powder and salt. Set aside. In a mixing bowl, using an electric mixer, beat the butter and sugar together on medium until very smooth, about 3 minutes. Add the eggs, one at a time, beating for 1 minute after each addition. Reduce the mixer speed to low, add half the dry ingredients, mixing until they just disappear into the batter. Mix in the milk, then the remaining dry ingredients, mixing only until they are incorporated. With the mixer on low, or by hand with a rubber spatula, mix in the malted milk balls and chocolate pieces. Drop the cookie dough onto the prepared baking sheets, one rounded tablespoon per cookie, leaving about 2 inches between each. Bake for 11 to 13 minutes, rotating sheets from top to bottom and front to back halfway through. I baked some of these for a 4th of July picnic but substituted the peanut butter whoppers for the regular ones. The cookies turned out fantastic. The peanut butter flavor was definitely noticalbe but not overwhelming. Everyone loved them. Thanks for the recipe. I’ll try your method. I use a chef’s knife because I like making neat Whopper halves rather than chunks and pieces, but your way is much safer. I’ll probably be the first one to chop off a finger ;). Leigh, you can order it off Amazon. However, grocery stores should have it. You might just need to ask for assistance. Sometimes they keep it with the ice cream stuff and other times they put it with the hot chocolate and chocolate drink mixes. Where do you find the malt powder at? I have tried 4 different grocery stores. I am dying to make these. Thanks! Kelli, strawberry plus malt is a great combination. I experimented with it a few years ago for some contest recipes. Taste of Home published this one and below that is another one which happens to be low in sugar and calories. Unfold thawed puff pastry sheet and divide into 3 equal strips. Cut each strip in half to make 6 pieces. Place puff pastry pieces a little over an 1 inch apart on an ungreased cookie sheet. Bake 15-17 minutes or until golden. Remove from cookie sheet and cool completely. Place white chocolate in a microwave-safe bowl. Microwave on high for 30 seconds. Stir. Repeat until white chocolate is melted. Beat cream cheese and vanilla extract into melted white chocolate. Beat in confectioners sugar and malted milk powder. Continue beating until smooth. Stir in strawberry puree. In a separate bowl, beat cream until stiff peaks form. Fold whipped cream into white chocolate/strawberry mixture. Split cooled pastry pieces in half horizontally through the middle to make tops and bottoms. Line bottom of a 13×9 inch dish with bottom halves of the pastry pieces. Spoon half of the cream mixture over pastry pieces. Spoon 1 cup of the sliced strawberries over cream mixture. Top with remaining pastry pieces, remaining cream mixture and remaining strawberries. In a small saucepan, whisk together Jell-o, cornstarch and water. Bring to a boil over medium heat and whisk gently until smooth and clear (3-5 minutes). Remove from heat and let cool for 5 minutes. Stir in malted milk powder, liquid coffee creamer and 2 cups of Cool Whip Free. Spoon mixture into 6 (6-8 oz) custard cups or wine glasses and chill until set. Spoon remaining Cool Whip Free over set mousse. Garnish with strawberries and mint leaves if desired. As if we didn’t have enough candy in the house already, my girls and I were at Target the other day and saw some Strawberry Milkshake flavored Whoppers. I had never seen them before and was thinking about this recipe and if they would work so we bought them. Needless to say, the entire box (and I hate to admit that it was a rather large box) is now gone. Both my husband and girls really liked them. Going to have to hide those things next time! What brand of malt did you use, Debbie? I thought they were very, very malty. I use Carnation, but one of these days I’m going to order some Horlick’s. I heard it was super malty. I made these this weekend and they were very good. I thought they would taste much “maltier” with a whole cup of malt but it was very subtle. I crushed the Whoppers with the bottom of a measuring cup. Not very glamourous but it worked. They didn’t completely crush, they broke in anywhere from 2 – 5 pieces. Yes. Whoppers are very similar to Maltesers. I’m sure Maltesers would work in these cookies. Sally, I didn’t realize the recipe had been around that long! Interesting. I made Whopper cookies last Christmas and they were absoulutely scrumptious! Are US Whoppers the same as UK Maltesers? Alicia, if you do make them, let us know what you think. Sandra, my mom got sick and couldn’t make it. But we LOVE the pumpkin roll. I’m not sure what brand goop Todd used, but it came right off in the shower. I love Fuzz’s costume. She looks really cute. Did all that goop wash off Todd’s face or did he have to wear it to work today….lol. Also did your mom like the pumpkin roll? 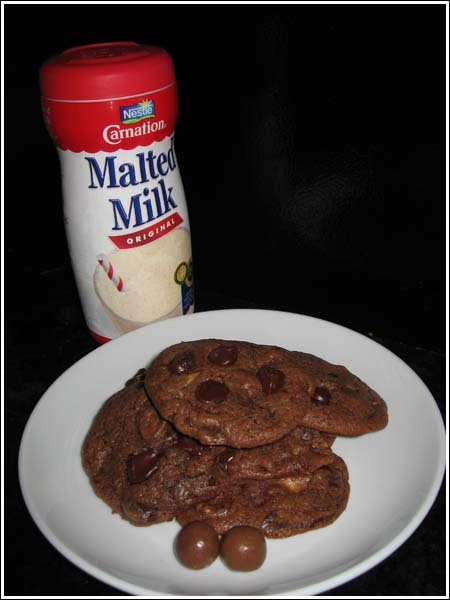 Oh my goodness.. I’m going to buy some malted milk powder and Whoppers tomorrow to make these. I LOVE malted milk, so these are perfect! Well, there was a lot of rolling. I am right handed, so I held the Chef’s knife in my right hand and used my left hand to hold the Whoppers in place. To avoid chopping my fingers off, I kept my left thumb extended backwards and out of the way and held the other four fingers together tightly. It’s easy to cut a finger, but not so easy to cut a hand. At least that’s what I kept telling myself. I haven’t ever taken a knife skills class so the way I do it may be MORE dangerous….but it didn’t feel that way. I cut most of the Whoppers in half and just used halves and a few quarters here and there. These sound delicious. Can I ask a potentially stupid question, though? How do you chop Whoppers without cutting your fingers off? Those things roll! Well, Whoppers sure do have a loyal following here. I hope you all try these because the cookies are SO worth the Whoppers. My dad loves Whoppers, too! We went through a whole carton of them together on a car trip when I was little. Just in case you have some in your pantry! I think Whoppers might be my favorite candy. So funny…my dad does the same thing, keys, wallet, change, and any candy he gets at Christmas, birthday, etc on top of his dresser. He also love whoppers. I’ve made several of these cookies but haven’t tried Dorie’s yet…I’m sure it’s great! I’ve always wanted to buy that malted milk powder, but I have no idea why. It just calls to me. The cookies look very very very good. I’ve been eyeing this recipe since I bought the book…too bad my kids didn’t get any Whoppers last night. Gld to hear such a glowing review! I just sent this book to my SIL as an “early surprise Christmas present” after she raved about the biscotti I made her. I told her I’d send her the recipe, but instead I sent the whole book. She was thrilled!